The 10 Rings of Power...What will be your legacy? The form below is a request to receive Dr. Vitale's private manifesto called 'The 10 Rings of Power.' It has never been sold or shared. To access it, please complete the form which will also be an invitation to join an extremely exclusive mastermind. 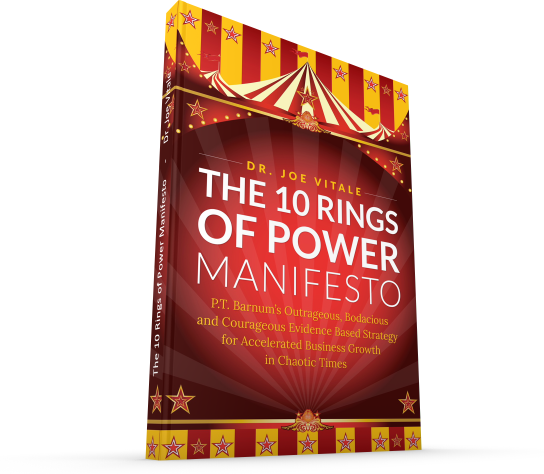 If you clear the review process you will be receiving a phone call from Dr. Joe Vitale along with the 'The 10 Rings of Power' Manifesto. Americans receive 4,000 to 10,000 advertisements every day. Average consumers see 20,000 brand messages a day. Online users see an average of 11,150 ads monthly. One study showed 15,220,700 texts are sent every minute. Another revealed 269,000,000,000 emails are sent every day. TV News averages 16 minutes of commercials per hour. What do you have to do to succeed in today’s fiercely competitive and overwhelmingly changing environment? How do you stand out in the marketplace? How do you get new leads or prospects? How do you constantly innovate? How do you stay healthy and sane in a world of stress, fear, disbelief and cynicism? How do you, as Star Trek’s Spock said, “Live long and prosper” - in the raging war of modern business? How do you break through all this noise and clutter and get your prospects’ attention? You can relax. I have the solution. If you are ready, willing , and able...now is the time!